Protects Your Hands And Fingers Without Losing Your Grip…It’s Perfect. Why Have You Gone Without It? Ready to end the frustration of low quality, hard to use oven mitts or gloves that don’t work? Want protection without sacrificing your grip? Like the idea of having durable, strong gloves that won’t easily tear? It’s time to get this so you can see what you’ve been missing. Virtually all customers marvel at how easy it is to simply grab a turkey with both hands, or retreive a potatoe at the bottom of that hot pot of water! Take them camping, Ekogrips are great for virtually all camping related tasks! Feel confident knowing you can just toss them in the dishwasher, or wash them like you wash your hands! Thickest, Highest Quality Silicone! Super Comfortable And Easy To Use, Must-Have For Cooks! Why wait another second? You should enjoy cooking or grilling without hassle or getting hurt, that’s why we made these. The joy of watching your family enjoy your meals is worth far more than the price you’re paying; you know this. Even if you’ve tried other products or solutions, you NEED to try this! 425 DEGREE HEAT PROTECTION WITH SUPREME QUALITY, RIP-RESISTANT SILICONE - We are America's Bestselling oven gloves for a reason! 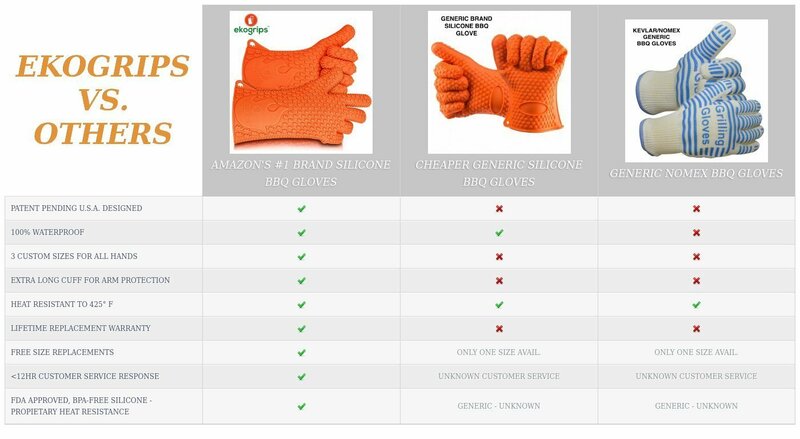 Our silicone BBQ gloves have become the standard for safety in kitchens, grills and campsites worldwide! Enjoy peace of mind with our proprietary, heat-resistant silicone, carefully reinforced to prevent rips or tears commonly seen with other silicone gloves. Protection from burns anywhere you cook! NO-SLIP, VERSATILE 5-FINGER GRIP & EXTRA LONG CUFF FOR ULTIMATE DEXTERITY - Ekogrips are the only cooking gloves featured on the Cooking Channel, Buzzfeed, As Seen On TV, and more! Three sizes ensure both hands and wrists are fully protected while grabbing hot items out of the oven or off the grill, without worrying about dropping dinner. Reach into hot water, open a tough jar, or even change a lightbulb with confidence. 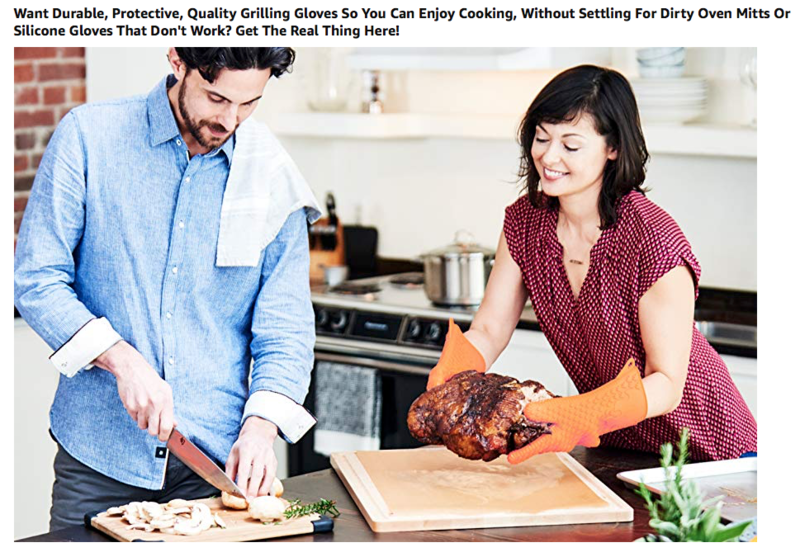 100% WATERPROOF, EASY TO CLEAN, DISHWASHER SAFE, FDA APPROVED & BPA FREE - Replace your stained, smelly oven mitts with these barbecue gloves that never stain or retain smells, and are a breeze to clean. Our proprietary, food-safe silicone can handle the greasiest mess and will clean up easily in the sink or dishwasher! HASSLE-FREE LIFETIME REPLACEMENT - NO NEED TO RETURN! We take pride in our perfect customer service record on Amazon, and we promise to treat you like family - even for gifts! In addition to our lifetime replacement, if you aren't happy with your purchase, we will simply refund your money - no questions asked - just let the reviews speak for themselves!